By default, Windows 7 comes with 13 themes, seven of which are "Aero", rich-experience themes (including frosted / transparent glass, animations, glow effects, etc.) The remaining six include Windows 7 Basic (an Aero theme variation designed for low-power consumption or underpowered notebooks), Windows Classic, and Microsoft's four accessibility themes. But you can download and install theme packs from Microsoft (and other third-parties). As with any kind of software, I'd recommend only downloading themes from Microsoft itself, or well established websites like DeviantArt. 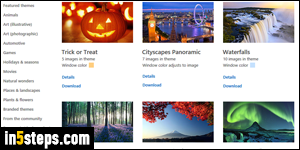 Here's the page on microsoft.com that lists featured seasonal themes, but includes many others, organized by topic: click on the links visible on the left to discover them! Once you found a theme you like, click on the Download theme button on the left (see screenshot). 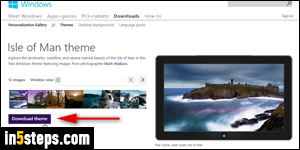 Save the "Windows theme pack file" anywhere on your PC. These files are typically under 10 megabytes, so it's a quick download! Once the file has downloaded, double-click on it: it will automatically install the new theme. You may hear a sound once it's installed, if that pack includes a custom sound scheme. If you minimize your open windows, you'll see a new desktop background: the next time you change wallpaper, you'll only see the pictures part of that theme. 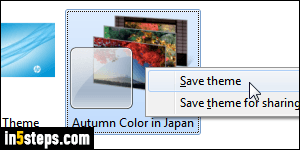 Don't panic quite yet: just select Windows desktop backgrounds in the dropdown at the top to see the original backgrounds!